In short, each advisor agreed to take on this endeavor and to create a plan that best supports the students and each grade level. 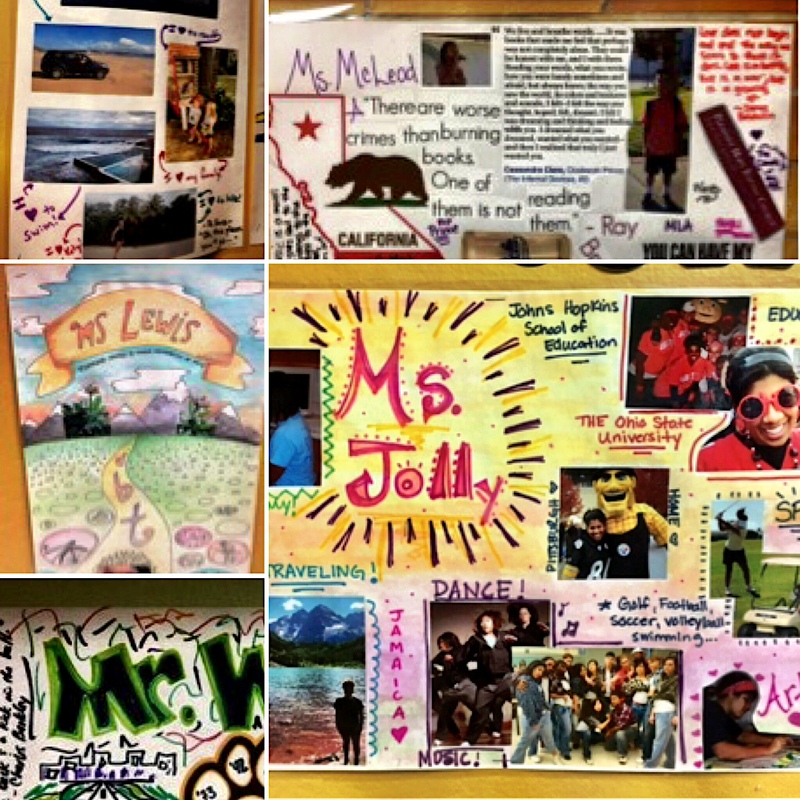 As a staff, we started off the academic year by sharing our interests and creating posters that represent us individually. The staff collaborated around this activity and we used it to motivate and connect with our students. Fostering a culture of student-driven interest has been very enjoyable and informative with my senior advisory. I actually introduced the topic of student interest at the very start of the year while my advisory was collaboratively creating our weekly schedule. I explained that we would be working on independent interest exploration during advisory and we needed to block off specific times for researching, discussing, and sharing. I gave them some examples of topics I would personally pick to explore, and they all began to suggest ideas for interest-based discussions. We decided use our Wednesday advisory time to circle up and share individual interests each week. After the schedule was finalized, Wednesdays became a day we all began to look forward to. First, students engaged in an interest survey designed by our Eagle Rock team. Specifically, students were asked to answer questions such as, “What makes you smile?” or, “What makes you feel scared?” They then analyzed their responses individually. How does poverty affect an entire community, including those not in poverty? Could we ever time travel? What is the time space continuum? What is quantum physics? What is the history of people and race? Where did different races originate? What is happening in the mind (brain) of a serial killer? How are people currently are being affected by large systems, such as the police, government, and education system? What the current state of policing is in our city? How do they really interact with people in our communities? Each Wednesday, a few students share their topics with the advisory, while their peers ask probing questions about their motivation for picking the topic and their current knowledge on the topic. I went first, modeling how to share and question. We are now moving into the research phase, which will begin to address our objective of improving independent research skills. So now that students have their selected their topics, the research begins! I have learned so much about my students already through the interest selection process. Students I thought I knew very well, surprised me by their choices, as for some their explanations were deep and personal. As an advisory, we have learned a lot about each other and I am excited to see where this process will lead us over the course of the semester. In the Pod I advise, exploring interests began with a scavenger hunt of various interests of the school’s staff. The students learned about the interests of teachers and administrators by observing staff interest posters outside of each classroom and office. Students were able to find staff members who shared similar interests and were also able to relate to some of the staff interests. We debriefed with a discussion about personal interests and how we can incorporate them in our Pod time, student internships, presentations of learning, and other academics areas. This led to students independently completing a graphic organizer to help them explore their own personal interests — which also included current news that stood out to them, fears they had, and unusual curiosities. During the first two months of school, students and their advisors have enjoyed working to determine their interests. In the second quarter, students will start working on a project about the interest they identified. It is our hope that as students continue to identify their interests, the staff can coach them to address individual skills in their projects. Since interests and independent work were the focus of our Growing Equity Together Summer Institute in Colorado this past summer, I’ve thought to bring it to my students in two ways. In my English class, students are given weekly in class trackers. Each day there are multiple assignment choices. While students have the ability to choose which assignments they would like to work on each day, there are a certain number of assignments due at the end of each week. The In-Class Tracker works as a way to foster independent working skills and allows me to conference with students individually. Additionally, with student interests in mind, I’ve decided to forgo teaching assigned novels and allowing the students to choose novels they would like to read based off their own interests. The results have been pretty great for a ninth grade English class. Students are reading and I’ve even had a couple of silent periods because students are so invested in their reading. During Pod, my students have had to dive deep into their interests. We’ve even taken to Wednesdays being a day where all students will share their interests with the class. Recently, one of my Podsters shared his love of puppetry with his peers. Only good things can come of sharing interest projects and I can’t wait until the presentations of learning in January. Editor’s Notes: Four additional schools — Fannie Lou Hamer Freedom High School in Bronx, NY; Highline Big Picture in Seattle, Wash.; Winooski Middle/High School in Winooski, VT; and Eagle Rock School — will soon share their Growing Equity Together updates and results with posts similar to this one. Check back soon for those updates. For more information about Baltimore’s City Neighbors High School, please visit http://cnhs16.wixsite.com/cityneighbors. For information on Baltimore’s City Neighbors High School’s use of Pods, please see http://cnhs16.wixsite.com/cityneighbors/advisory. This entry was posted in Deeper Learning, Growing Equity Together Project and tagged Andrea Rhea, Cheyanne Zahrt, City Neighbors High School, Deeper Learning, Growing Equity Together, Pods, Presentation of Learning, Rushie McLeod, Summer Institute, Tamara Jolly.